I made this dress shortly after I finished my last shirt in the previous post. I needed a palate cleanser and this dress pattern looked easy. And it was! Super easy. It's basically a sack with a drawstring. I'm pretty pleased with how it turned out although I'm not 100% about the long kimono sleeves. I might shorten them. Pattern Description: Burda 6732. 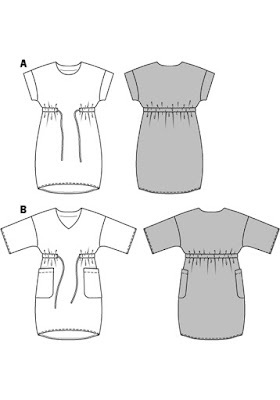 A sack dress with a drawstring casing around the waist and deep patch pockets. One version has long kimono sleeves and a v-neck and the other has a jewel neckline and sleeve bands. 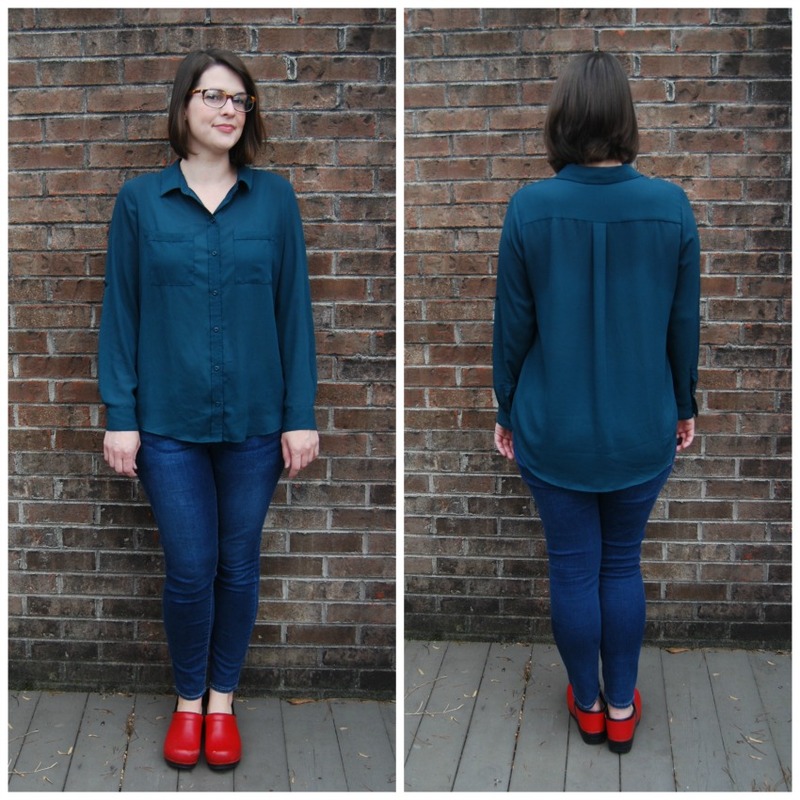 Pattern Sizing: Burda sizes 36-46. I made a 42 but I think I'd size down to a 40 next go around. At least on the top half. I didn't really have any fit issues because again, it's a sack. The side seam/under arm seam could be closer to the body. Fabric Used: I used a printed linen I found at Joann's. I picked it because I thought it was the right weight for this dress- not too lightweight but not too heavy either. And the printed pattern on it keeps it from being see-through. And I really love linen. Alterations/Deviations: None! Absolutely none. Didn't mess with the length. I didn't even mess with the back neckline after all that fitting I've done on those shirts recently. The back neckline could use some minor adjustments ( I think I'll take a small dart in the back of the neck next time before cutting out fabric) but nothing I can't live with. The v-neck is done with a facing. Likes/Dislikes: I like the v-neck. I love where the drawstring hits. And I love the deep patch pockets even if I didn't sew them perfectly. You can't tell in the busy print anyway. Conclusion: Super easy, relaxed dress with some nice design features- the drawstring, the hem and the necklines. I made this dress as a casual dress I could wear to work when it gets warmer but I think it looks pretty dressy after all. I would love to try it again in a fabric with more drape. I have a rayon poplin in my stash that I have in mind. I am not entirely sure about the length of the sleeves. Next time, I think I'll try the version with the sleeve bands but I may still shorten the sleeves on this dress. Shirt Making. Shoulder Fitting. Blergh. That's how I feel about it. I'm even having a hard time writing about all of this. Maybe I ventured in to shirt making for too long. Although it's not the actual sewing that I'm so meh about. It's the fit. I did all sorts of alterations and adjustments and you can't tell. Or I can't tell. Or I don't know if I can tell. Ugh. Anyway, I didn't solve my shoulder fit issue like I thought I would. So yeah, blergh. Time for a break from making shirts. I started with a Simplicity pattern that I knew deep down wasn't going to be great. But it had design features that I was digging. It had a seam through the middle of the shirt and different options for the back so you could use two contrasting fabrics. I'd love to tell you the pattern number but the Simplicity website is such a mess, I can't find it. And the pattern I actually have has some weird display number on it. The top left photo in the collage above is of two of the versions I made of this particular Simplicity pattern. I actually made a third version that I took apart to reuse the bottom half on a subsequent version. The bottom half of the shirt is an awesome batik that I have hoarded for a long time, which makes me sad. The very first version I sewed up had a shoulder fit issue that I have experienced multiple times since I started sewing (and has made me abandon projects often). So I made a proclamation that I was going to solve my fit issue for once and for all. I took a few cell phone pics so I'll show you one horribly unflattering photo to give you an idea of what I'm talking about. I know you can't see much in this photo, but I was trying to get a photo of how the back neckline bunches up. The shoulders don't sit right and they don't feel right. I get wrinkles on the front in between the armsyce and neckline. And the back neckline rides up the back of my neck. That really is my main issue. The back neckline is uncomfortable. It rides up and bunches up at the base of the back of my neck. I also get horizontal wrinkles at the back of my neck, which you can see in the photo above. According to Fit For Real People, that means a square shoulder adjustment, right? I find I do much better with wider necklines and also patterns with back neckline darts. I have read up about all the things it could be but have never come to any sort of definite conclusion. Maybe forward shoulder? I did end up doing a forward shoulder adjustment later on- see below. High round back? I don't have any gaping at the back of the neck or the back armscye. I actually tend to have pulling across the back in between my shoulders and the back neckline feels snug. So are my shoulders broad? I don't know. Maybe it's a combination of several things. I really, truly don't know at this point. I think all this fitting has made me even more confused. I've also suspected I had some broad back issues in the past. I have had some success with making a quick and dirty square shoulder adjustment where I just straighten out the shoulder seam. Which is what I did on the second two versions of the Simplicity pattern I tried (among other things). But back necklines (and sometimes front, too) never seem to sit right. I read up on shoulder adjustments in the books Fit For Real People (Pati Palmer and Marla Alto) and another called The Perfect Fit (author listed as Creative Publishing Int'l). I used the square shoulder adjustment seen in the collage above. Later when I tried a forward shoulder adjustment, I used the method described in The Perfect Fit. There was one main discrepancy between the two books regarding a forward shoulder- one said to rotate the shoulder point on the sleeve and one said not to. So I was confused about that. I did end up rotating the shoulder point forward. Is there any reason I shouldn't have? 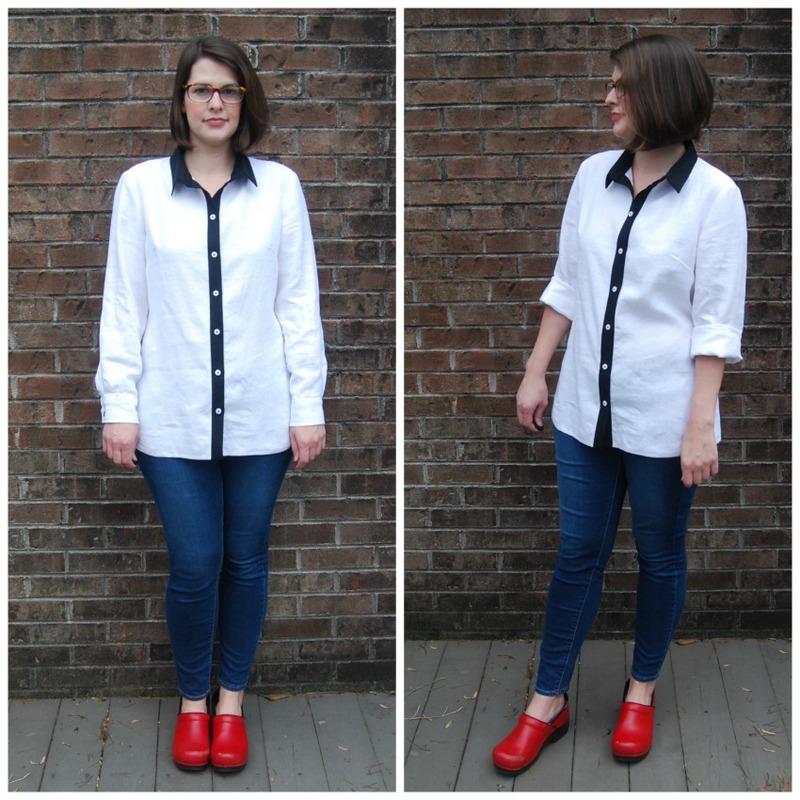 Eventually, I realized there were too many other fit issues with the Simplicity pattern (sleeve issues, no shaping, one piece collar and cuffs not even remotely the right size) to make a salvageable shirt. So I abandoned that pattern and looked for another. 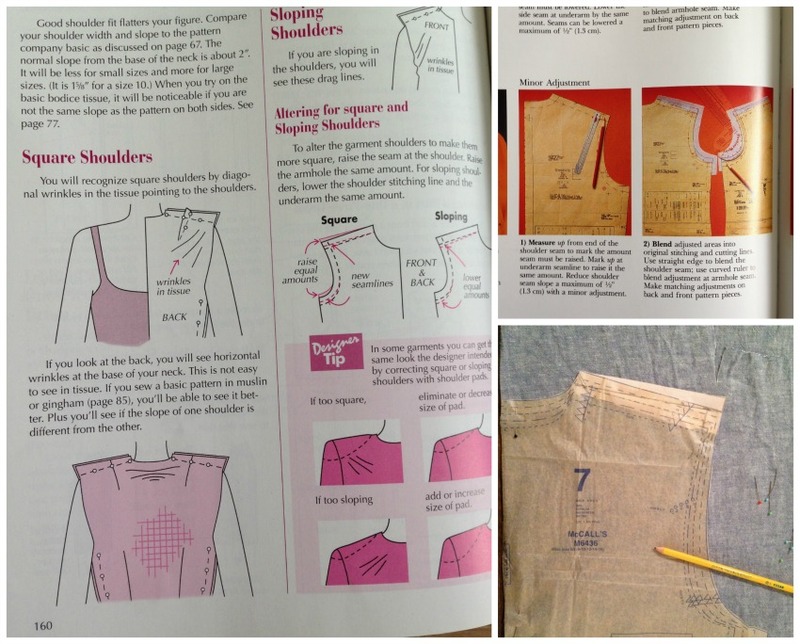 I flipped through the pattern books and ended up buying McCalls 6436. This was a much better shirt pattern than the Simplicity one. But I'm still not thrilled with my end result. My first version was the chambray colored linen version on the top right of the collage above. I decided to sew a size up to begin with thinking I could take care of my supposed broad shoulder/broad back issues. And I did a square shoulder adjustment but I can't remember how much. It turned out way, way too big. 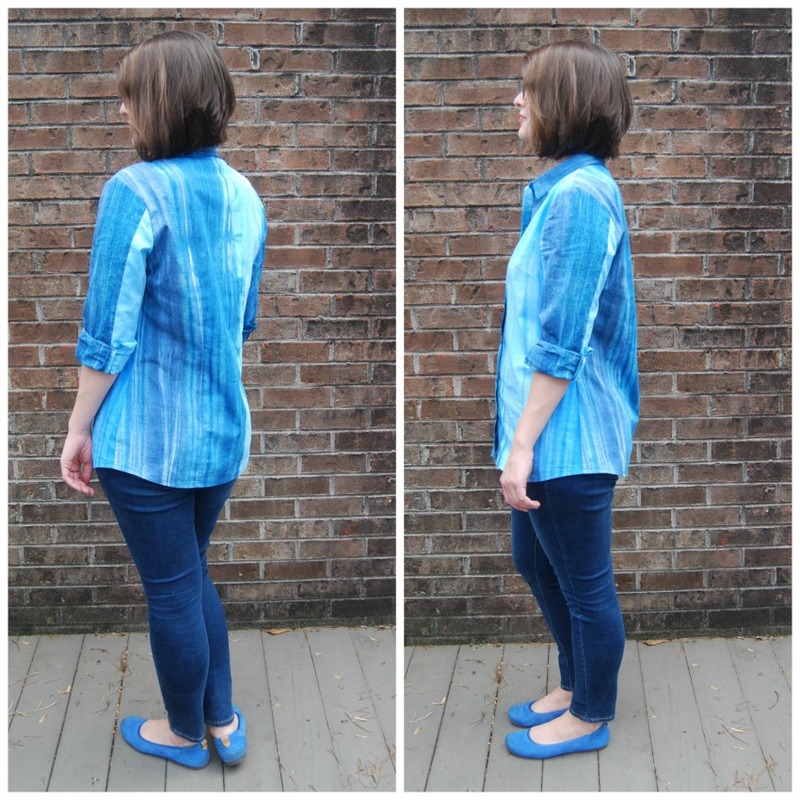 I'd say this shirt pattern has an large amount of ease (it's supposed to be relaxed, I think). I also discovered that the sleeves were more than two inches too long. 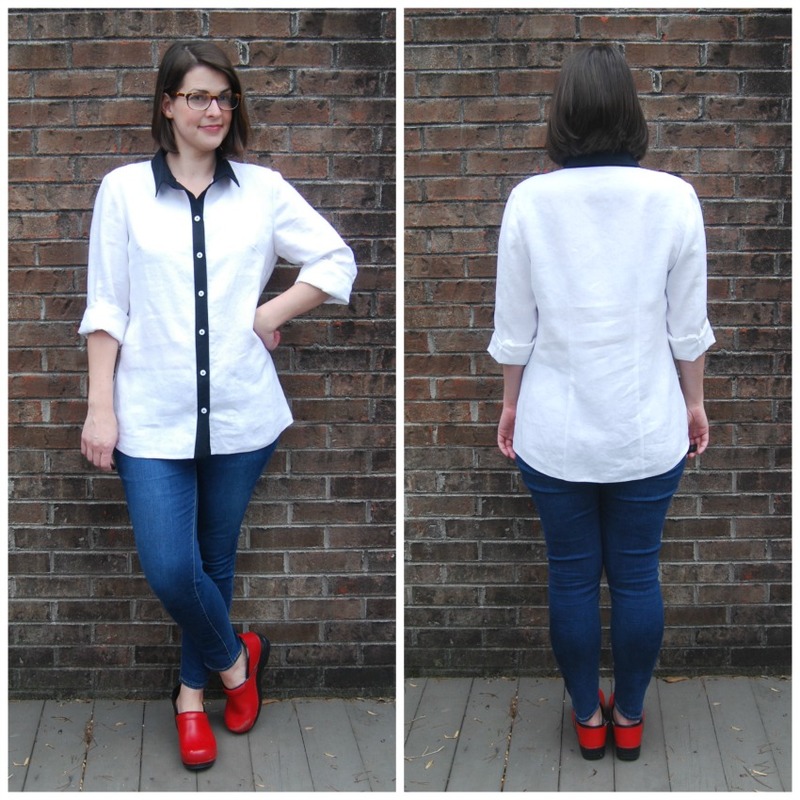 I took the cuff off of one sleeve and attempted to shorten it before abandoning this shirt. I could possibly work on the sleeve issues and make this a wearable shirt in the future. It would be wearable in a big, boyfriend shirt kind of way. I'm saving it for now but we'll see. Next I made the white and black linen version. I used my normal size, a 14 grading to a 16 at the hip, but also made some shoulder alterations. I took notes on my last two versions so I could document what I did. I did a 3/8" square shoulder adjustment on the back shoulder seam only to also account for a forward shoulder (which I have suspected I needed). I also reduced the height of the collar and collar stand by a teeny bit and shortened the sleeves 1.5 inches. I didn't mess with the darts or side seams at all, although I think I could have. I do feel like the shoulder fit is better than I've ever had before, but something still feels off. The armscye feels too low, which is crazy considering my shoulder issues. But I will say that the forward shoulder is a move in the right direction, I believe. 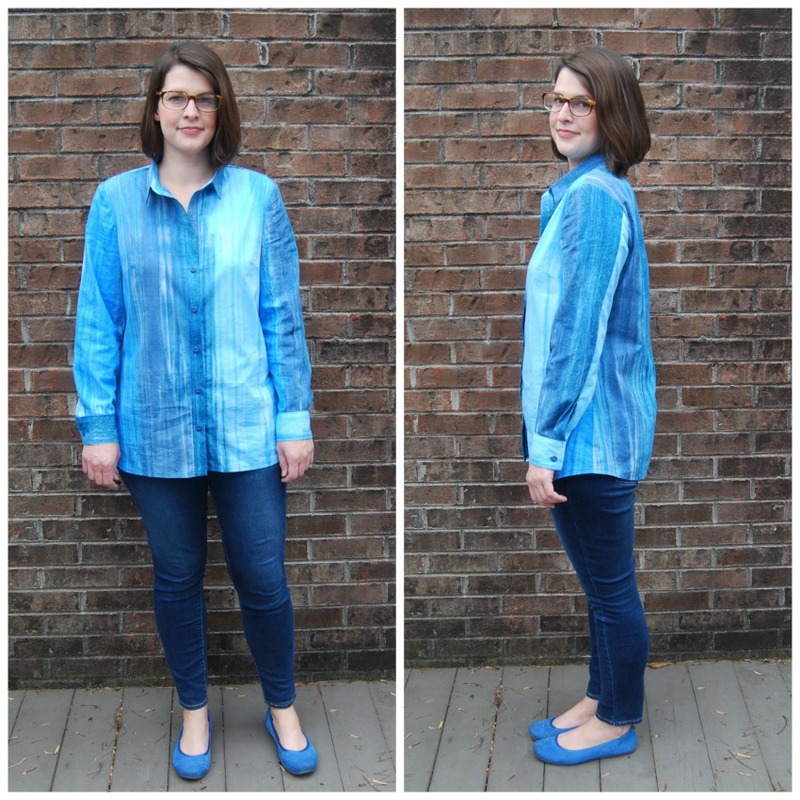 The last version I sewed was the blue batik shirt. This was supposed to be the culmination of all my fitting work where I ended up with a fantastically fitting shirt (that's how it works, right?). I did a 3/8" forward shoulder adjustment but did it on the front and back shoulder seam. So I essentially did a forward shoulder but skipped the square shoulder. I also raised the armscye 3/8" and reduced the collar height a tiny bit more. The collar is teeny tiny! I made it too small. And I shortened the sleeves another 1/2"- so 2" total from the original pattern (and I have long arms!). And meh. The fit is just meh. I actually feel like I have that creeping back neckline more on this version than the white version. So maybe I do really need the square shoulder adjustment followed by the forward shoulder adjustment. 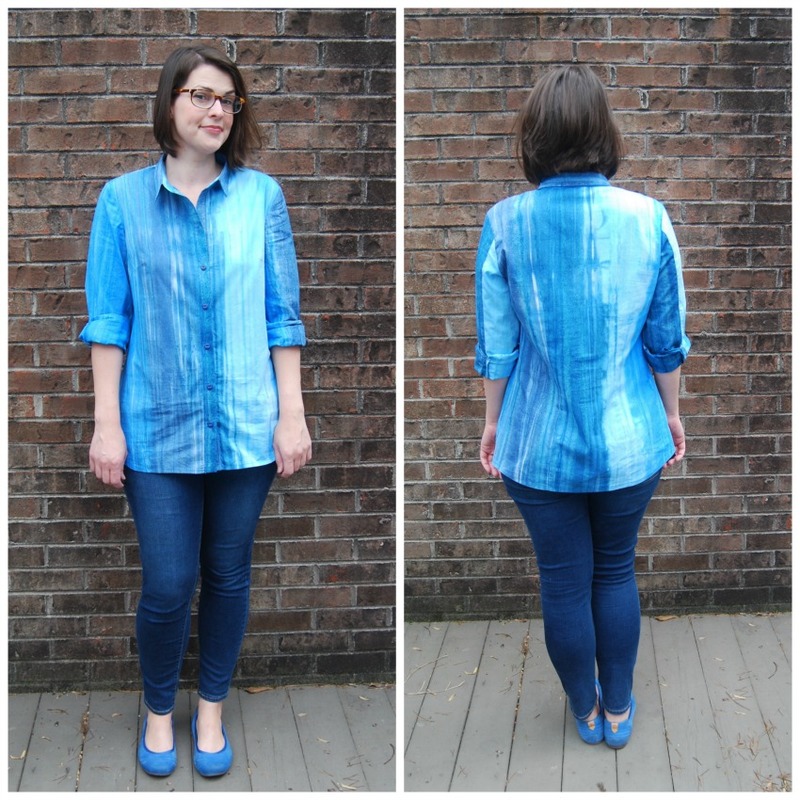 The blue batik fabric I used is beautiful, but not ideal for apparel. I think its meant for quilting. It wrinkles like crazy. I ironed it right before pictures and it wrinkled just from trying to tuck it in to something. I am really pleased with the placement. I ran the stripe vertical instead of horizontal after soliciting advice on instagram. I tried to balance the dark and light parts of the fabric and I'm happy with how it turned out. If you've made it this far in this blog post, congratulations! You are a champion. It has been hard to write so I know it's been hard to read. Just for shits and giggles, here is a photo of me in a rtw shirt that I love and wear all the time. I don't experience any issues with the back neckline riding up or the shoulder/armscye being uncomfortable. Looking at the photo, though, I don't see that the shirt fits fabulously or anything. In fact, it doesn't appear to fit that well at all. But it definitely feels better. It does have a back yoke with a pleat, so maybe that is the difference? The fabric also has more drape but it's nothing special. Just some hard wearing polyester. I've written this post over a few days and now that I've read back through it this last time, I realized I've gone down a fitting rabbit hole. I'm probably overanalyzing. If I end up venturing in to shirt making again, I think I'll just go for a totally new pattern. But now it's time to sew something really fun. On a positive note, I will say that I had the opportunity to work on my precision sewing skills with all this shirt making. I beefed up my top stitching and collar sewing skills for sure. 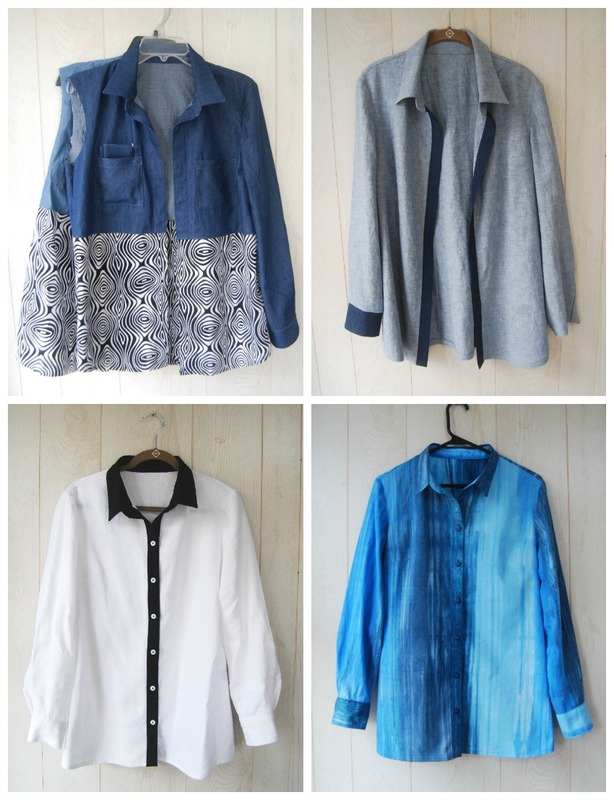 And I'm sure I'll wear the white linen shirt quite a bit but I'm on the fence about the blue batik shirt. Anyone else have shoulder fit issues?